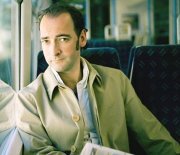 Alistair McGowan - Who do you Think you Are? After graduating from there in 1989, he began working as a stand-up comic at London's Comedy Store and the Edinburgh Festival. From 1991 until 1996, he provided the voices for some of the characters on Spitting Image. the Duke of York's Theatre, for which he received an Olivier nomination; Emcee in the musical Cabaret (2008) at the Lyric Theatre and the Duke in the touring version of Shakespeare's Measure For Measure (2009). Recently he appeared in the title role of The Mikado in the Carl Rosa production of Gilbert & Sullivan's operetta. 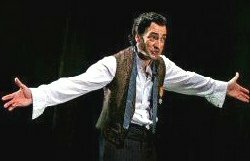 He directed & performed in a concert version of The Mikado for Raymond Gubbay, which toured in 2010 & 2011. 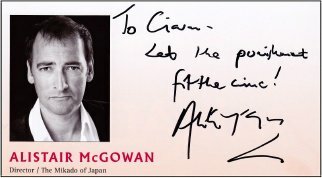 As a TV actor, McGowan played Spock in Tim Firth's thirteen-episode series Preston Front (1995-97); Redwald in Dark Ages (1999); Mr Kenge in Dickens' Bleak House (2005) and the title role in the quirky detective show Mayo (2006), for which he also wrote several of the episodes. has presented features on The One Show, and sat in Dictionary Corner on Countdown. In 2007 he was featured on the popular genealogy programme Who Do You Think You Are? Starting in Calcutta, he traced his paternal line in India back to the mid-1700s, discovering, to his great surprise, that his roots were not Scottish but Irish! roots on Who Do You Think You Are? On the big screen he has appeared in Driving Aphrodite (2009) opposite Richard Dreyfuss. He also played Norris McWhirter in David Baddiel's film The Norris McWhirter Chronicles. McGowan's first play, Timing, was premiered in London in October 2009. It received 'Best New Comedy' nomination in the Whatsonstage.com awards 2010. His directing credits include Semi-Monde by Noel Coward at the Guildhall School of Music and Drama. He devised the show Cocktails With Coward in which he performed many of Noel Coward's well known songs with Charlotte Page. The Edinburgh Festival run in 2009 was a sell-out, and further performances at the Riverside Studios in 2010 also proved a success with the public. McGowan is obsessed with football, and since his university days, he has been a keen supporter of Leeds United FC. He has released two football comedy videos Football Backchat and The Second Leg. These became cult viewing in the 1990s. He has written A Matter of Life and Death; Or How to Wean a Man Off Football with Ronni Ancona - an autobiographical self-help book about football as an addiction. In a Guardian interview, McGowan tells how his obsession with football led to the break-up of his relationship with Ronni Ancona. thwart airport expansion plans, by selling off tiny plots of the land to thousands of different people! 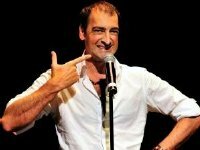 Alistair McGowan remains single, and lives in Barnes, the riverside suburb in southwest London. Alistair has signed my Mikado programme "Let the punishment fit the crime!" BBC - Who Do You Think You Are? a better visual likeness for some of his characters like Dot Cotton. 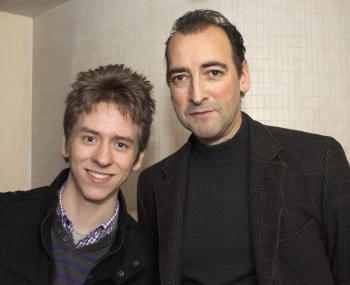 I met Alistair McGowan after I had seen him perform in the title role of Gilbert & Sullivan's operetta The Mikado (which he also directed) at the Royal Concert Hall in Nottingham in January 2011. I told him how very much I had enjoyed the performance. He signed my programme with the quote 'Let the punishment fit the crime!' which is taken from one of the songs that the Mikado sings.